One of the most elegant buildings on Madison Avenue, this handsome cooperative apartment building has an undulating base that is perhaps the most attractive in the city as its sinuous curves ripple and soften the building's mass. The building was designed by Rosario Candela and Mott B. Schmidt, two of the city's foremost residential architects, to replace one of the city's most celebrated mansions. 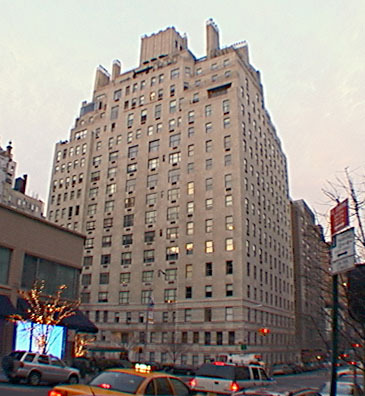 "Candela's last luxury apartment, designed in collaboration with Mott B. Schmidt, was 19 East Seventy-second Street of 1936, replacing McKim, Mead & Whites fabled Tiffany mansion, which had stood at the northwest corner of Seventy-second Street and Madison Avenue since 1882 and which was torn down without much notice by the public." "The 100-by-140-foot site was large enough," the authors continued, "to permit the new building to wrap around a small garden court, directly visible form the lobby through a broad expanse of glass. Many features, such as the metal balcony rails, reflected the designer's response to Modernist work, yet the massing of the sixteen-story limestone-clad building was traditional, with two projecting end 'pavilions' bracketing the broad central motif along Seventy-second Street. While there was no cornice, and the fenestration along the upper floors was freely arranged, the first three stories of the building, probably based on Josef Hoffmann's Austrian Pavilion at the 1925 Paris Exposition des Arts Décoratifs, alternated continuous bands of cyma moldings to form a base that was at once unconventional and fundamentally within the Classicist tradition. Above the entrance, C. Paul Jennewein carved a marble relief panel populated with storks, deer, and other delights of nature and the imagination." 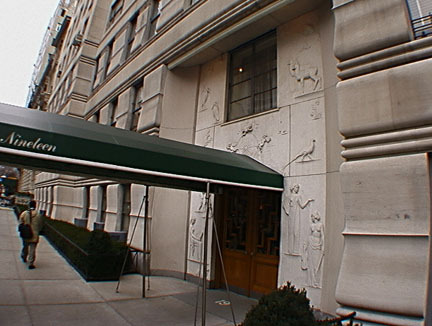 An article in the May, 1998 issue of Quest magazine by Andrew Kay noted that the animal and nature motif of Jennewein is evident in several places in the building: carved into the handsome wood doors are a snail and lizard; the elevator walls are covered with panels of animals etched in relief; in the garden stands a bronze sculpture of a fawn that serves as the building's mascot." The article noted that residents in the building included architect Richard Meier, magazine editor Lewis Lapham and Joseph Cullman, chairman emeritus of Philip Morris. The building has several duplex apartments. The Charles L. Tiffany mansion that it replaced "looked like it might have been Stanford White's homage to his mentor, H. H. Richardson," wrote Hawes, adding that "It was a huge brick fortress on a heavy, parapetlike stone base, with a steeply pitched gable for a roof and a wide semicircular arch and grille for a front door." .With the appearance of the new Tiffany house, the idea of sharing houses made a tiny inroad into high society," Hawes observed. The loss of the Romanesque Revival Tiffany mansion was a sad commentary on the city's sensitivity to the need for historic preservation, especially since it was catty-corner to Gertrude Rhinelander Waldo mansion that was to become the Ralph Lauren boutique at 867 Madison Avenue. There are many, although not enough, limestone-clad luxury apartment buildings in the city. Such facades, in fact, probably are the easiest clue that an apartment is truly "luxury," which is not to imply that brick and glass structures are automatically not "luxury." Many fine apartment buildings may only have limestone bases and most are rusticated, that is sharply, or roughly, delineated as large blocks, usually in a quite bold, horizontal pattern follow the model of many Italian Renaissance palazzos. This fine building, clad entirely in limestone, has perhaps the best base in the city. It is sinuous. Its very graceful and subtle arcs of the curves are superbly proportioned and soften the what would otherwise be the traditionally hard edges of the building. The vertical curves, which are limited to the lower three stories, give the otherwise quite formal building an undeniable and memorable air of graciousness. They are a constant reminder that too many developers, architects and particularly building managers are contemptuous of pedestrians and their occasional need or desire to lean, sit or perch against or on a building and that curved surfaces are more inviting than spikes, or hard edges. The use of curves in architecture is fairly uncommon simply because it is not "industry-standard" and costs more. The huge popularity of architect Frank Gehrys geometric convolutions, such as in the Guggenheim Museum in Bilbao, Spain, however, is likely to encourage more usage of curves (see The City Review article on Gehry). The rectilinear street grid of most of Manhattan, of course, is still very influential, almost as much as the citys building code and the economic realities of development. This 17-story, 40-unit buildings has a canopied entrance with a doorman and a concierge and there is a pleasant garden court visible from the lobby. The building has some terraces and few but large apartments, but no garage, not health club and no sundeck. The top of the building, which was erected in 1936 and converted to a cooperative in 1949, has some unusual windows, reflecting some unusual apartments, although the facade above the base is quite plain. 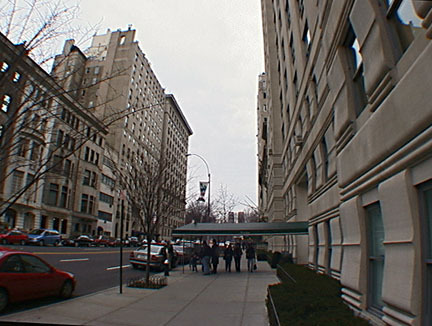 Because 72nd is a Central Park transverse road as well as a major cross-town street, there is considerable traffic at this location, which is convenient to famous boutiques on Madison Avenue and many leading art galleries and museums. Candela is widely considered to have been the countrys greatest designer of luxury apartment buildings and he collaborated with many of the citys most famous architectural firms. This was his last major project. Candelas buildings, "it is said, were the grandest of the decade that was itself the greatest," wrote Elizabeth Hawes in her book, "New York, New York, How The Apartment House Transformed The Life Of The City (1869-1930)", published by Henry Holt in 1993. Born in Sicily, Candela came to the United States in 1909 and graduated from the Columbia school of architecture in 1915. His other famous buildings include 834 and 960 Fifth Avenue, 720, 740, 770, 775 and 778 Park Avenue, all considered among the most glamorous addresses in the city.